Rising from the Copper Glacier, Alaska’s Copper River flows through a glacier-carved landscape of steep mountains and fields of sand dunes before emptying into the Gulf of Alaska. The river is choked with silt and lined with sand. It is also prone to high winds. The combination results in spectacular dust storms, such as the one observed by the Moderate Resolution Imaging Spectroradiometer (MODIS) on NASA’s Terra satellite on October 30, 2009. In this image, the wind is blowing from the snow-covered mountains to the Gulf of Alaska. The wind picked up fine sediment from the riverbank and carried it over the ocean. The pale brown plume of airborne dust contrasts sharply with the dark ocean beneath it. The sand and silt come from the combined erosive power of flowing ice and water. Heavy glaciers grind rock into fine sediment and gravel as they flow slowly down mountain valleys. 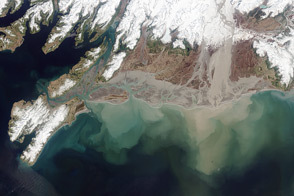 The sediment washes into rivers and streams, and much of it eventually makes its way to the Copper River. The flowing water of the river also erodes away rock, adding to the accumulation of sediment from glaciers. As a result, the Copper River is lined with sand, including broad fields of sand dunes in some locations. The large image provided above is the highest resolution image available (250 meters per pixel). The MODIS Rapid Response System provides the image in additional resolutions. 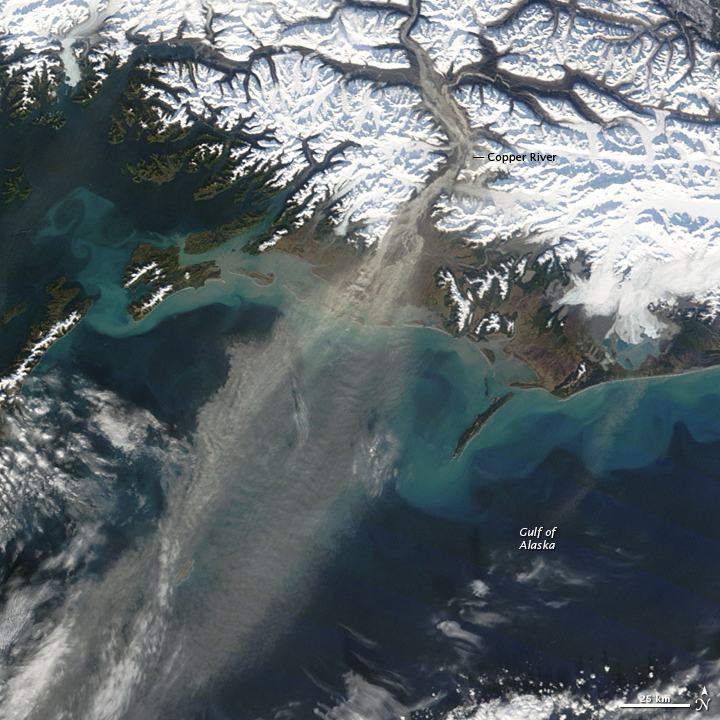 Strong winds over Alaska’s Copper River blows a distinctive plume of pale brown sediment over the Gulf of Alaska in this true-color image from October 30, 2009. 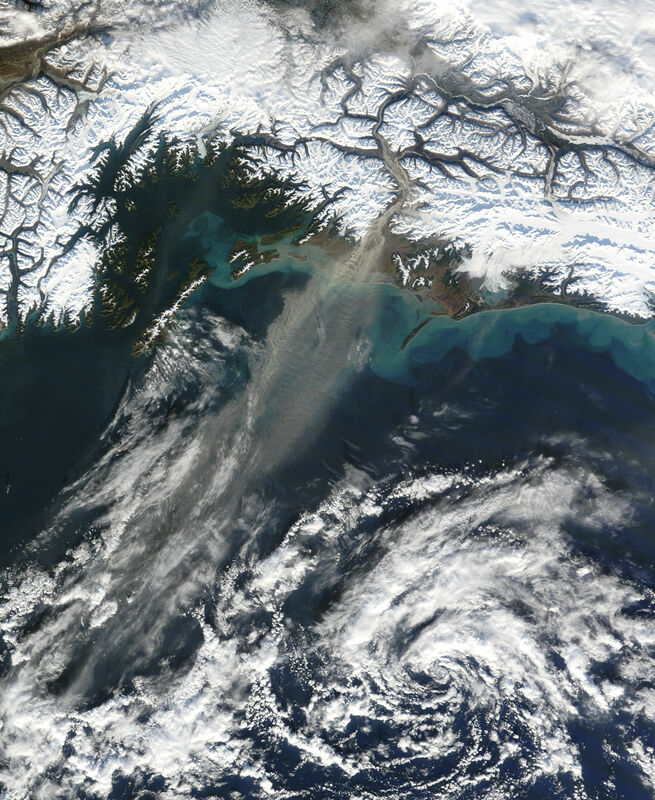 Fine dust blew over the Gulf of Alaska on October 29, 2009. National Park Service. Copper River Float. Wrangell-St. Elias National Park and Preserve. Accessed November 2, 2009. National Park Service. (2006, November 21). Forces of Change. Wrangell-St. Elias National Park and Preserve. Accessed November 2, 2009.